Greetings my friend, as you well know there has been deep trouble thanks to the interdict and to the most un-Christlike actions of Viterbo. The damage caused by the lack of pilgrimage has been immense, indeed it was this very thing I feared most and why I started the wool venture. I desire to wean Rome from dependance on such things. We should not be at the mercy of pilgrims showing up or not. If we are we give the Papacy, the Faliscans, and anyone else that can shut down the pilgrimage a way to control us completely. None should have such control over the Romans but Romans themselves. As you are aware this dependance has left me unable to pay you my full due this month. As a Christian I seek to amend this at the soonest possible time and assure you that I will be able to (god willing) acquire the means to do so shortly as my investments bear out more fruit. In the meantime I ask you to consider the future beyond just the coming of the emperor and the pope. We must look to insure nobody can harm us like this in the future. Furthermore Viterbo must not go unpunished for such disgusting and unchristian behavior, seeking to do not only harm to the Romans but to the unsuspecting pilgrims that wished to visit here as is their Christian right. Such honesty is most appreciated. Indeed, you should attend the reunion. However let it be said that, even though the intentions of the Pope seem bening, Rome hasn't been the target of much of his benevolence. I am wary, and the Senate will be as well. I ask that you remember the Treaty of Konstanz. Although this Pope did not sign it, I believe that he will abide by the words of his predecessors, and that means the King of Germans has his ears. I say this because a previous request you had made to me regarding your involvment in the preparations for the arrival of Frederick has been favored by most of the Lesser Council. Of course some obvious obstacles are present, but it matters very little for the time being. Some of the consiliariis might think you are in a position to dupe the Senate. Honestly, we can hardly say the contrary. But you are a sound man, and honest. Above all, you love the Romans. I prefer to trust you. Perhaps you can slip a word to His Holiness about Rome's interests in becoming friends once again. There's no need for hate and violence when we can be at peace and between friends. The dogs of Viterbo have cost us dearly this season! The sinners have been lying to the pilgrims so that we wouldn't benefit from their presence in our humble City. They must be punished for their sins. I have been thinking about it. This situation highlights a speech I delivered the past season about diversifying our economy. We cannot be controled by a foreign entity. They have seen the trouble it caused us, and will no doubt make use of petty tricks again in the future in an attempt to cripple us further. We all know what this will lead to... and we cannot allow -that-. The Commune of Rome remains ever hopeful for peaceful and blessed resolution as regards the coming of the King to Latium and the Eternal City. Let it be known to the Curia and His Holiness that the Romans stand ready to participate in any negotiation that may yet take place. This is a matter of grave concern to the Senate, and we would entreat His Holiness that he allow the presence and participation of a diplomatic delegation sent by the Commune of Rome so as to ensure the proper representation of the Roman people, and to better enable action by His Holiness as concerns the matter of Coronation. Frederick will soon arrive in Latium, as we are all of us aware. I would know your intent as concerns this arrival. I have taken the initiative to petition the Curia for the participation of a Roman delegation at any negotiation that may take place between His Holiness and the German King. In turn, I would ask that you appoint me to lead this delegation, as I have served in such capacity in the past. Tell me of your will, Consul, and I will endeavour to make the position of the Romans known. We must tread carefully, for there is power enough marshaled to bring our government to ruin. Though I have not broached the matter with him directly, I do not believe His Holiness would be inclined to involve the Senate of Rome in negotiations between the Curia and the King of the Germans. The Imperial crown may only be granted by His Holiness and only be received by a prince of the Empire duly elected; your proposal to me seems a great presumption on the part of the Romans, who, not satisfied with the expulsion of the Pope from Rome, now apparently desire to interpose themselves into matters of the universal empire of Christendom. I must warn you, Senator, of the sin of Pride, for which the people of Rome are notorious and which has in the past led them to error and disaster. His Holiness is indeed inclined to receive the representatives of Rome in the presence of the King, but separate from and subsequent to negotiations between His Holiness and the King of the Germans over the matter of the Imperial crown. I apologize if I have given offense, for that was not my intention. The Senate does not seek in any way to interfere in the diplomacy of the Church or the Empire. I only sought to inform Your Eminence of the desire of the Romans to be present at any negotiation or audience that His Holiness sees fit to include us in. The Senate does not presume to possess the power of influence over any crown, and merely would hear of the will of His Holiness as concerns any possible coronation, the better to prepare the Eternal City and the Romans should that become necessary. I would not have the arrival of His Holiness or the King of the Germans marred by the spilling of civil blood. It is ever my desire to protect the Romans from their own passions, which as we know, easily and often result in conflagration. The Season of the Emperor - IMPORTANT! This turn is a very special turn, and I think it is best if we approach it in a special fashion. My idea is to break down the few in-game weeks between June 1st (the current in-game date) and Frederick's arrival at Rome into a series of mini-turns, or "Events." Each Event, instead of a full update with news and finances and everything, will just describe the next event in Frederick's march to Rome, after which players will have a chance to discuss the event and respond to it. Once this series of events has run its course, we will resume our regular schedule and the update for Summer 1155 will follow as normal. To avoid stretching the process out interminably, each of these Events will only have a limited time before their deadline - say, 3 days. That's not a lot of time, but presumably you won't need as much because these updates won't require you to make OOC orders. You can write OOC orders if you want - if they concern the event at hand - but your normal inquests will wait until the actual Summer 1155 update. His Holiness has agreed to permit the presence of a delegate of the Roman Senate in the Papal entourage that will meet with the King of the Germans once he arrives, so long as it is understood that this delegate is merely an observer of, rather than a participant in, negotiations between His Holiness and the King. This delegate will remain only at the pleasure of His Holiness and the King of the Germans and shall be duly removed if his presence becomes unwelcome to either. I would have you be aware that, with some difficulty, my efforts have born fruit. His Holiness will allow the presence of a single delegate in representation of the Roman Senate at meeting between himself and the King of the Germans. This delegate will be placed among the Papal entourage, and will hold the position of observer only. Allow me this honour, and I shall be as the eyes and ears of Rome so that we might better prepare ourselves for what might come of the arrival of the German King. I make the case that I myself am most suited to this task in having represented the Commune previously, and owing to the relations I have already established among the members of the Curia. I must know of your intent, Consul, so that I might depart with all haste to Civita Castellana. and pilgrimage guides reduced to begging in the alleys. For once they can't blame Manzinni's guide pamphlets. It occurred to me that, despite giving you occasional updates about what's going on in the rest of Europe, we have no map to show you what things are like outside of Italy. Well, now we do. I threw this together today and it will stay posted on the front page. 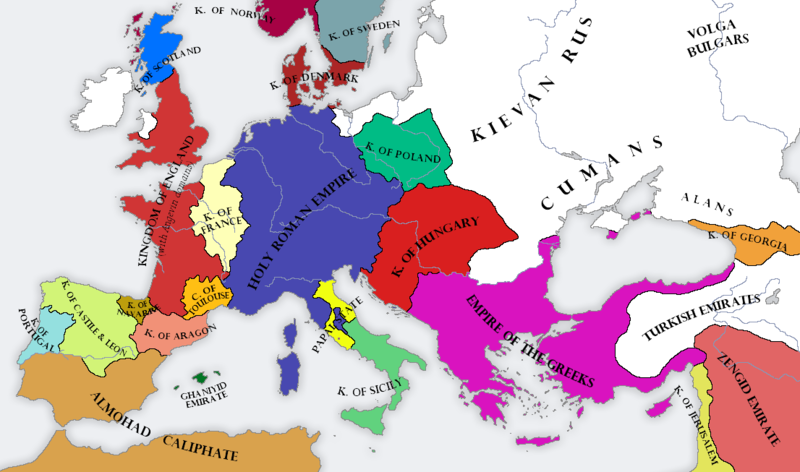 Note that it is a pretty rough map, sufficient only to give you a general idea of the political situation in Europe. I don't intend to update it each season like I do with the other maps, though occasionally I might edit it to reflect a big change. In any situation in which this Europe map disagrees with the Italy map, you should assume the Italy map is correct. As you suggest, I will appoint you our delegate to the negotiations between Pope and Frederick. Make haste and tell us what these two conspire. As Consul of the Exterior it is my duty to treat with foreign powers, such as the Pope and Frederick. However it seems that my presence would be best felt in Rome in case anything we're to happen in our fair city. In my place I am sending Senator Basile to observe the talks as our delegate. It is an honour to again represent our city to the world, Consul, and know that I will do all that is within my power to ensure the preservation of the rights of our Commune. I will watch, and I will listen, and all that I come to know I will send back to Rome so that we might prepare ourselves for what is to come. I will not quail before the Pope or the German King, but instead stand firmly. It is my hope that all parties might yet maintain a mutual respect for one another, and in so doing, spare Latium the violence that has consumed Lombardy. I do this not for myself, or for the Senate, but for the People of Rome whom we represent - so that they might sleep soundly without fear of depredation. I depart this very day for Civita Castellana. The Senate of Rome is most grateful for the honour of this inclusion granted by His Holiness, and is in full understanding of its status as observer. The Consuls of Rome have seen fit to appoint my own person as delegate given my standing relations among the Papal Curia. I expect I shall be tasked to remain by the Senate should the continued presence of a representative of the Commune be deemed necessary by His Holiness. I depart for Civita Castellana immediately so as to ensure my timely arrival. - Depart for the Papal court at Civita Castellana with a retinue of 30 of my armsmen (preferably ones whose armour has been completed) so as to present myself to the Curia as Roman delegate in preparation for my position in the Papal entourage. Bring my splendid paludamentum - safely stowed - so that I might wear it come time for negotiation. Leave temporary management of my estate in the capable hands of my son, Ricardo, and my wife, Julia. At the beginning of June, having made great speed southwards from Lombardy, the King of the Germans drew near to Latium. Riding along the Via Francigena, he passed Viterbo and encamped his army on a great meadow known locally as the Campo Grasso (literally, “plump field” or “fat field”) just outside the walls of Sutri. From there, he sent an envoy to Pope Adrian, who remained still at Civita Castellana. The Roman observer, Senator Roberto Basile, had traveled to Civita Castellana with his guard but was rebuffed at the gate; the Civitonici would not allow his armed men to enter, and the Papal Curia was evidently not interested in intervening on his behalf. With no other option, the Senator left his guardsmen encamped outside the city. Even alone, however, he was not given an audience with the Papal Curia, which only deigned to see him later when they were prepared to leave for their meeting with the King. Patrician Giordano Pierleone, who was then in the presence of the Pope along with the great nobles of Latium, sent word to Senator Basile that the envoy of the King had sworn in the King’s name that Frederick would not make any attempt against the Pope or his Curia, nor make any hostile act against the Pope’s possessions and holdings, for he had come in faith and honor to uphold the terms of the Treaty of Constance. The envoy invited Pope Adrian IV to make his way to the King’s camp. The envoy’s assurances notwithstanding, many of the Cardinals advised the Pope against leaving the security of Civita Castellana; they noted that Ottaviano dei Crescenzi, the Cardinal-Priest of Santa Celicia, had that morning left the Curia and gone to Frederick on his own, and feared that he might have made some conspiracy with the Teutons. Adrian dismissed their objections as cowardice and rode forth from the city with his Cardinals and entourage. The Pope was welcomed loudly by the Teutons, who hailed him with a great roar and the waving of their swords in the air. Adrian and his entourage proceeded on horseback to the King’s tent, where the Teutons had placed two thrones of wood. There our delegate first saw Friedrich von Hohenstaufen, King of the Romans, a broad-shouldered man in his early 30s with a golden circlet upon his brow and a long beard that was strikingly red compared to his blonde hair. The Pope stopped before the tent, waiting for the King to hold the Pope’s stirrup as he dismounted from his horse, as is the custom of Emperors-elect when coming to Rome. Frederick, however, did not do this, but merely sat in his throne and waited. Apparently seeing in this a gesture of impending hostility, most of the Cardinals and their men abruptly turned and fled, galloping straight out of the camp and leaving their Pope with little more than a handful of bewildered retainers. Adrian waited for a few excruciatingly awkward minutes, then finally dismounted by himself and sat in the chair provided for him. Only then did the King stand and approach him. Frederick kissed the Pope’s feet, as is custom, but when he stood to give the Pope the kiss of peace, Hadrian waved him away and said, “You have denied me the service which, out of reverence for the Apostles Peter and Paul, your predecessors have always paid to mine, and until you have satisfied me I will not give you the kiss of peace.” His words were translated from Latin by his fellow Englishman, John of Salisbury, the delegate of King Henry II to the Papal Curia. Frederick, visibly incensed, replied that he, the King of the Romans, would certainly not deign to be the Pope’s groom. The Pope replied only with an irritated sounding “hmm,” stood up from his chair, got back on his horse, and rode straight out of the camp and on to Nepi with what was left of his entourage. As the Pope rode away, the steady hoof-beats of his horse were the only sounds audible in the stunned German camp; our representative noted the surreal spectacle of a great host of German knights, who had been shouting jubilantly mere minutes before, standing silent and agape as if their jaws were about to fall off. The look of consternation and fury on the King’s face convinced Senator Basile to follow the Pope’s example and make a prompt exit. It is now late night on the 9th; Senator Basile has just returned with his news after a hard ride from Sutri. As far as we are aware, the Pope and his Cardinals are at Nepi, and the Teutons are still at the Campo Grasso. Orders (optional, of course) and letters are due by June 9th, when the next event will be posted. The news of the apparent quarrel between the King and the Pope has prompted a hastily-gathered midnight meeting of the Roman Senate. The middle-class Senators and Arnoldists claim it is a chance to win the King to the Roman side against the Pope, and that he should be invited into the city at once. Other senators, particularly the nobles and equites, argue that trying to drive a wedge between the Pope and the King is likely to backfire, and caution against any bold invitations to the King considering his prior responses to Roman entreaties. The King of the Germans has come to Latium with one goal foremost in his mind: to be crowned Imperator Romanus Sacer by His Holiness the Pope. He is a prideful man, and by the dark look I saw upon his face after that fateful meeting he will not relent until he possesses what he desires. The impasse I have observed between these two men on behalf of Rome will not so easily be resolved in our favour by a simple entreaty to the King. I could not say how events will proceed from this point. Will Frederick relent and appease His Holiness? Will the contest between them escalate unto violence? This is something unknown to me. In this instance I must implore the Senate and our duly-appointed Consuls to maintain a position of neutrality in this matter. It will resolve as it will resolve, and I fear Rome can influence the course of events but little. We should not stick our hand into the den of the lion, lest it be snapped off!